Question: Do you like free stuff? A: Yes! I love free stuff. Please tell me more! B: Nah, mate, I’m good. Free stuff is boring. If you answered A, keep reading! If you answered B, you’re crazy. Keep reading anyway. We’ve noticed quite a bit of creativity from our Facebook followers lately. From unique DIY ideas to awesome adventure shots, you’ve been keeping us entertained. In fact, we’re so impressed with your instax skills, we’d like to reward you with spectacular (and highly enviable) instax gear. Sound good? Great! How Do I Enter the Flash Contests? Step 1: Stay tuned to our Facebook page. Twice a month, we’ll be holding a flash contest. We’ll ask you to drop some instax knowledge and/or examples. Step 2: About 48 hours before the contest, we’ll post a reminder on Facebook, Twitter and Instagram. This means it’s time to get ready! Step 3: Prepare your entry. Dig through your collection of prints, or embark on a quick photo shoot. Then, get ready to submit. Step 4: We’ll announce the flash contest question on Facebook. You’ll have 24 hours to submit your entry via the link provided. Step 5: Visit the instax Win in a Flash contest page linked to in the Facebook post to fill out your entry and click submit. If you’re one of the first 20 to respond, you win a prize pack! Some contests may also include the opportunity to choose an alternate prize. If this is the case, we’ll announce the alternate prize before the contest starts. What are the Contest Themes? Which instax product is your absolute favourite? Do you favour one camera colour or style over another? Can’t get enough of the the instax SHARE printer? Choose the instax product you love most, and send us a photo you’ve created. From scrapbooks and displays to gifts for your family and friends, when it comes to instax the DIY options are endless. Do you like to get creative? Send us a pic of your all-time best instax DIY project! Like most things, instax is better with your BFF. How do you and your best pal use instax? Share a creative photo of you and your mate and you could win a pair tickets to see @We Are Your Friends, starring Zac Efron! Instant photography offers plenty of opportunities to commemorate special moments while adding your own personal stylish flare. Show us your favourite instax moment for a chance to win! It’s easy, it’s portable and, best of all, it’s instant! From weddings to sporting matches, family reunions to school formals, instax is the perfect camera for any event. How have you used your instax at an event? Share your favourite event photo! All contests close after 24 hours. That means you need to think (and enter) fast! After the cut-off, additional entries will not be considered. If you win one of our contests, congratulations! Now step aside and let someone else join in the fun. Winners are automatically disqualified from future contests. 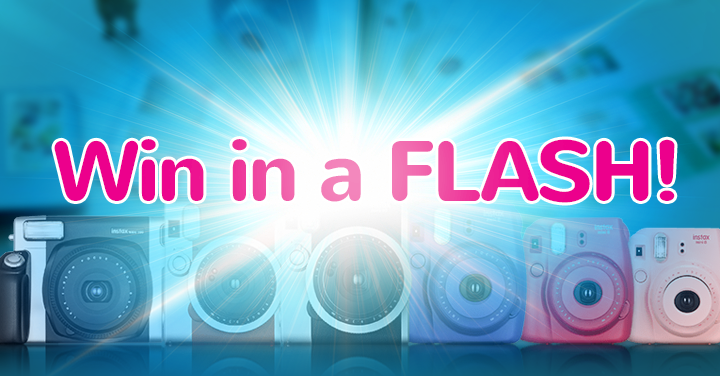 Flash contests will begin 25 July 2015 and end 19 September 2015. Now that you have all the details, it’s time to get ready. Gather up your best instax photos, practice your posting speed. Best of luck! Love instax, but not sure where to buy one? Our store locator can help you find an instax retailer in your area.